A visit to a different Aesop store is a different adventure every time. 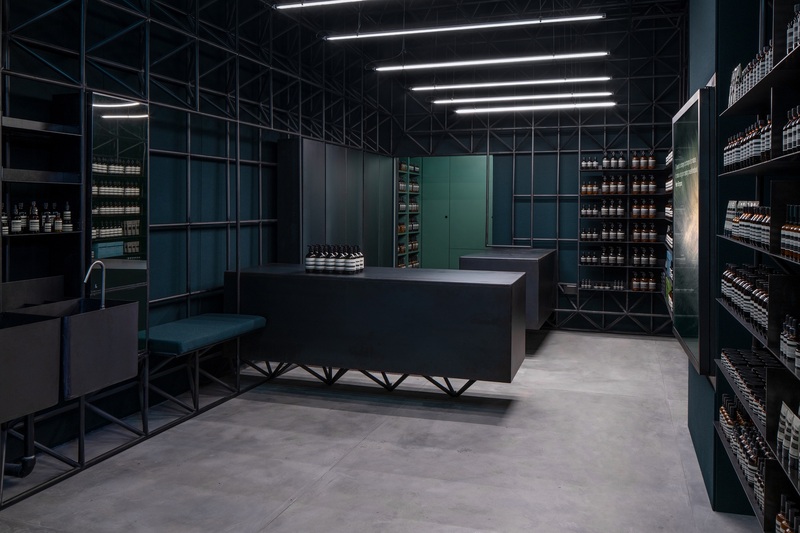 The latest chapter in architectural intellect written for the Australian luxury skincare brand can be found in Penang, in which the 40sqm store displays a meditation on contrast, based on the built and natural, the concealed and the exposed, the robust and the soft. 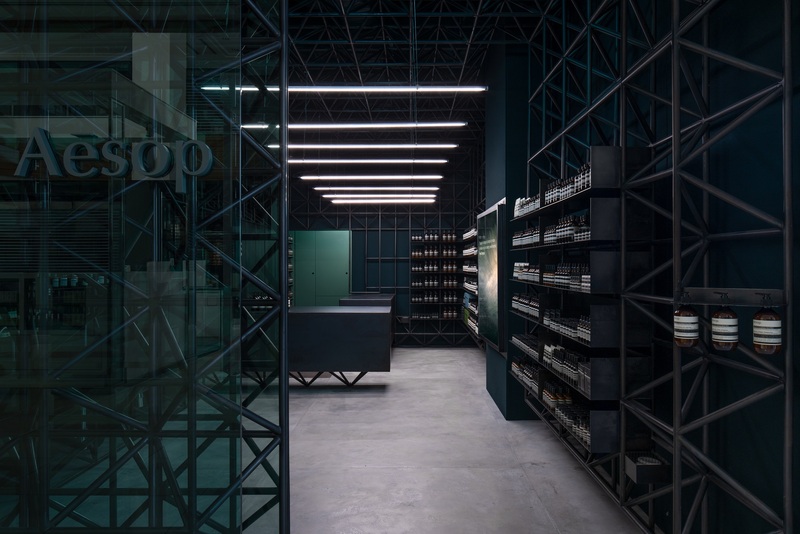 Located in Gurney Plaza, the new signature store was created by the Aesop’s in-house Design Department, conceived as an exploration of the urban condition of Penang. The modestly proportioned interior is framed by a structure of tessellating steel supports, stretching from floor to ceiling, and wrapping the walls to recall an exoskeleton or refined scaffolding. Assuming a palette of forest green, the wool-covered walls effect a pleasing softness in contrast to the steel geometry, whereas the solid and angular forms of the floating demonstration sinks and sales counter. Customers may explore and select from a complete range of skin, hair and body care products, distinguished by botanical and laboratory-generated ingredients of the highest quality. Top notch assistance from the store’s trained consultants are also always at the ready to offer advice about products that are best suited to each individual’s needs. In light of the inaugural Aesop store launch in Penang, the release of the latest Aesop Skincare Kits comes at a perfect time in drawing in potential new customers on the island. 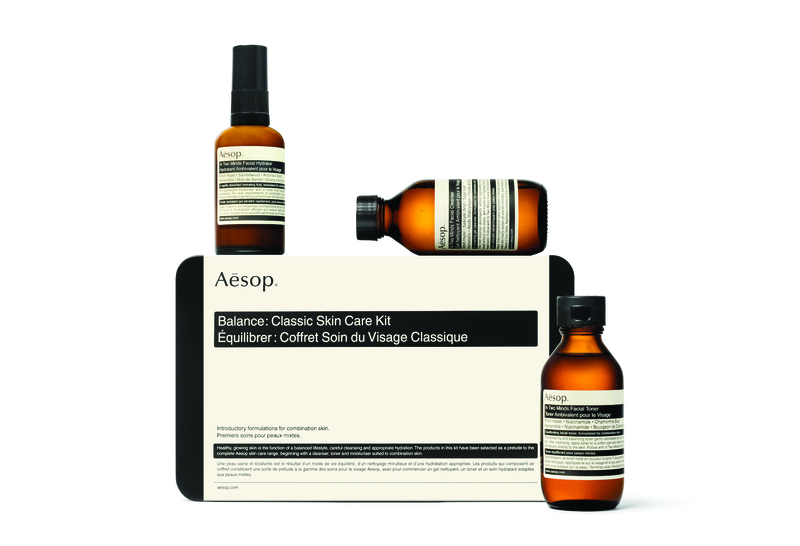 The three new skincare kits – Parsley Seed Anti-Oxidant Skin Care Kit, Balance: Classic Skin Care Kit, and Quench: Classic Skin Care Kit – form part of Aesop’s permanent range, as an introductory skincare regime for new and existing Aesop customers, who are looking to try another range of products to support their current skincare routine. The kits, presented in a utilitarian black tin case that may be reused after its original contents have been enjoyed, are also an ideal solution for frequent travellers seeking to maintain their usual daily regimen en route and beyond, with products portioned in compliance with airline restrictions. 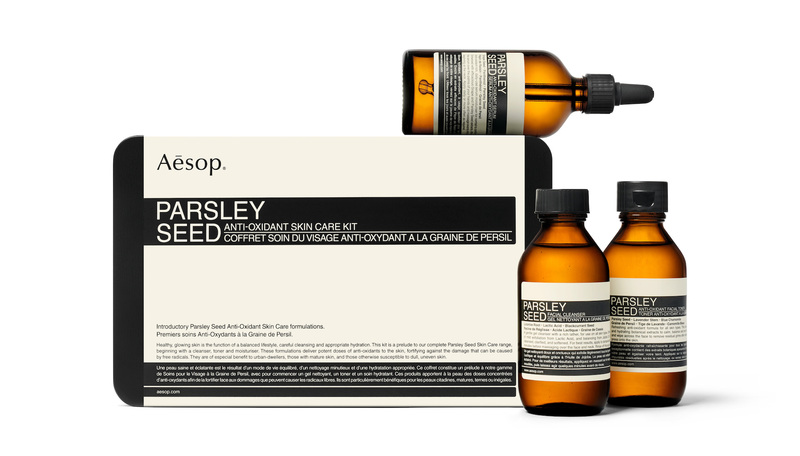 The Parsley Seed Anti-Oxidant Skin Care Kit provides an introductory regimen ideally suited to those residing in urban environments, offering not only an introduction to the much-loved staples from Aesop’s Parsley Seed Skin Care range. Consisting of a facial cleanser, an anti-oxidant facial toner and an anti-oxidant serum, each product contains Parsley Seed extract, an ingredient rich in anti-oxidants, to help fortify the skin against the damaging effects of pollution and other sources of free radicals. Used in complement with one another, these formulations leave the skin feeling clarified, balanced, and lightly yet thoroughly hydrated. The Balance: Classic Skin Care Kit, on the other hand, is an introductory regimen suited to combination skin, highlighting the In Two Minds range launched just last year, featuring a facial cleanser, a facial toner and a facial hydrator. Formulated especially to address the skin type’s complex needs, this efficacious trio gently but thoroughly cleanses to remove oil, grime and residual impurities, balances the skin’s surface, and replenishes hydration, leaving skin feeling clean, smooth and supple. 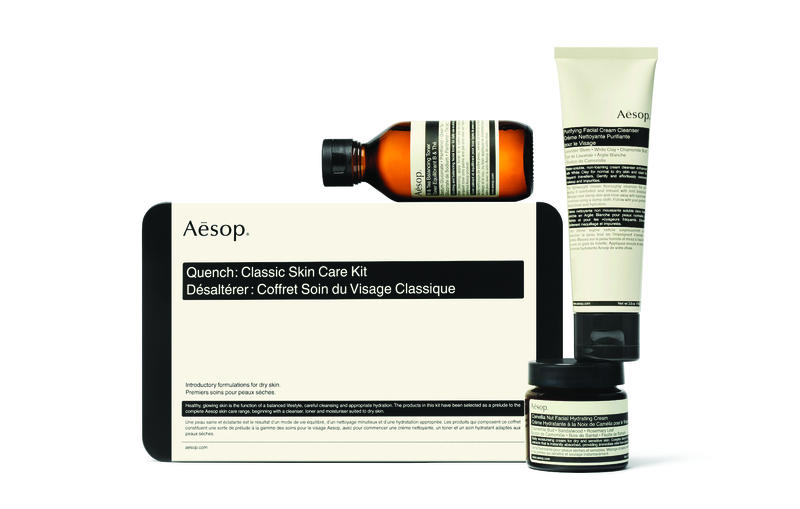 Lastly, the Quench: Classic Skin Care Kit is especially for those with dry skin with an introduction to the much-loved staples from Aesop’s Classic Skin Care range. Comprising of the gentle, non-foaming Purifying Facial Cream Cleanser, the alcohol-free B & Tea Balancing Toner, and the richly nourishing Camellia Nut Facial Hydrating Cream, this particular trio imparts hydration at every step to leave skin clean, balanced and softened.